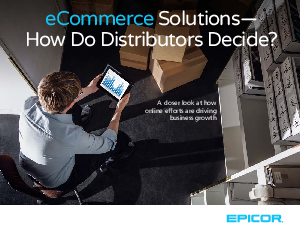 > Epicor > eCommerce Solutions - How Do Distributors Decide? There’s no question eCommerce has changed the distribution landscape. The real question is how those changes fit into your business strategy. Is eCommerce a core capability that wholesale distributors need to survive, or does it play a more supportive role while services differentiate your business from others? Either way, you need a smooth flow from your customers’ expectations to your business process. What matters most to distributors in eCommerce? What about eCommerce and ERP? The eBook also provides a first look at how Epicor eCommerce solutions can set your business apart and drive growth. If you’ve found your business competing with the likes of Amazon and Grainger, or you need to be able to manage more services for more customers, don’t wait to download your copy of this eBook!